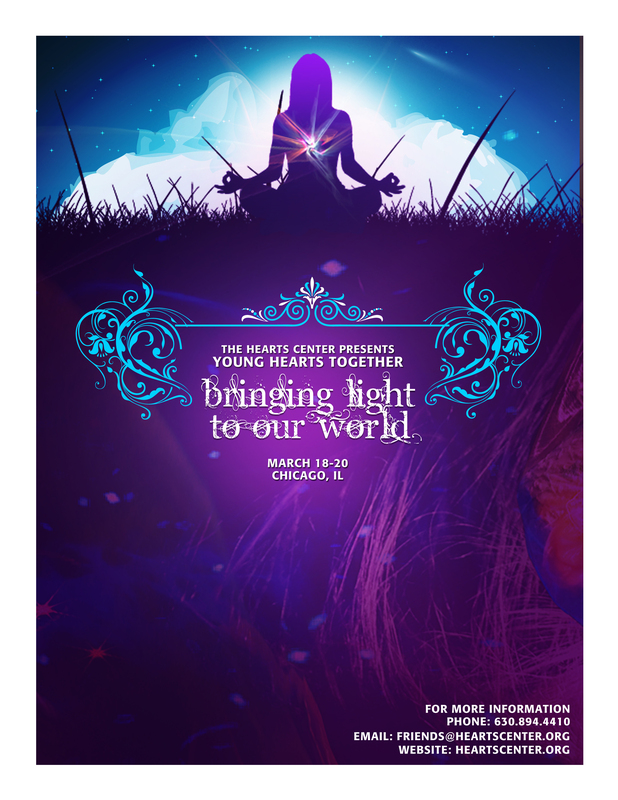 Begins Friday at 6 p.m. Ends Sunday 5:00 p.m.
Young Hearts Together—Bringing Light to Our World is an event for our youth, created by our youth. Like no other event ever sponsored by The Hearts Center, Young Hearts Together will be a paradigm-shifting experience for all because our young people are leading the way. See a vision for a beautiful tomorrow through their eyes. Moving with the winds of the ageless Holy Spirit, our program is packed with fun, laughter, music and lively dialogue. Presentations by our youth cover such topics as sharing God’s light through photo and video, the spiritual side of relationships, and living successfully. Our youth will be bringing their light to the world in more ways than one! As usual, this event will be audio and video broadcast. In addition, the youth will create YouTubes of each of our Q and A segments! In one Q and A, the youth will ask adults questions. In another the tables will be turned! In the final taping, all participants may share what they have learned about creating and sustaining fulfilling relationships with family, friends, and, of course, that special someone. So we’ll be videotaping ourselves videotaping all day Saturday! How cool. With one or more friends create a 10-minute or less YouTube that shares an uplifting, spiritual message a teen or twentyish person would enjoy, would really understand. It could be a skit, an interview, a panel discussion, a musical, a dance interpretation of an aspect of the spiritual path. You are doing more than entertaining. You are sharing what is real in you of your connection with the divine, with God. Save your video file as the title of it, including the name of a contact person from your group. In your email, list all who participated in making the video if you didn’t add credits to the end or beginning of the YouTube. Send your email with your video attachment to Mario at mariomeza@heartscenter.org by March 10th. That’s it from you! During the week before our event, a panel of judges of all ages, comprised of experts in the fields of video, drama, music and marketing, will review each submission. First, second and third-place winners will be announced on Sunday, March 20, the final day of our event. First place award: $ 150. Second place: $ 100. Third place: $ 50. Happy video creating! And then, fly, drive, bus or railroad yourself to Chicago to be with us for Young Hearts Together, March 18-20! Huge news: $5,000 Youth Scholarship created for this event! If you are between 12 and 29 and require financial assistance to make it to Young Hearts Together, email friends@heartscenter.org or call 630 894 4410, requesting an application for this scholarship. Or use this link: application. Lodging may be free for you if you register early since Joe and Lisa’s home is as huge as this news with many bedrooms and a few large areas that will be set up as dorms. Meals will be prepared onsite or catered, costs covered by local heartfriends. Even if you are a student, you can afford this event. Final day to apply: February 16. A priceless experience. As a youth you are our guest for this event. You are in store for a priceless experience. See you there! Interact with other spiritual young people at a brand new site, “Risinghc,” http://risinghc.spruz.com/. 2:30-4:30 Square dancing in the barn—all invited! For free accommodations as guests of local heartfriends, call 630 894 4410 or email friends@heartscenter.org. For convenient and economical accommodations, contact La Quinta Inn and Suites before February 18th for lowest rates at 847 882 3312. Ask for group reservations and tell them you are with The Hearts Center. After February 18th, the rates may rise a minimum amount. To book with La Quinta online after Feb. 18, go to their site now. All meals will be prepared at the meeting location or catered. Love offerings at each meal are requested to defray costs. For directions to our venue, call 630 894 4410, or email, friends@heartscenter.org. Book flights to O’Hare International Airport or Midway Airport. Join our heartshare teleclass continuing the theme of Young Hearts Together—Bringing Light to Our World, Thursday, April 21, 2011. Enjoy past teleclasses at www.heartscenter.org. Under “Events,” scroll to “HeartShare Events” to select a teleclass.